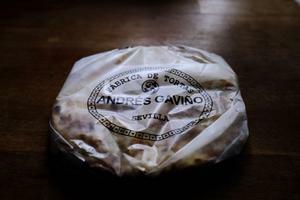 On this particular day, where I had to use up lots of potatoes—I fancied the idea of potato slices with something. Most of the time will be spent on chopping the potatoes—well it depends on how many you have but lets just say use lots! You’re going to cook the potatoes separately in lots of water. 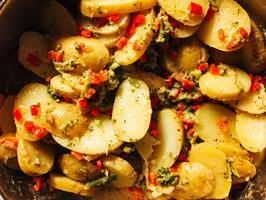 This will speed up the cooking time and give you lovely soft firm potatoes, that melt in your mouth. 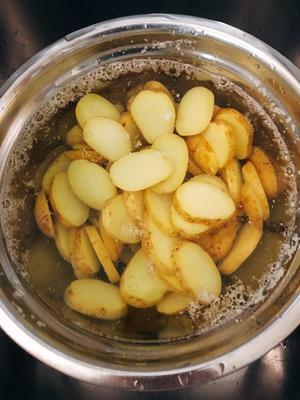 Cook the potatoes in salted water. Use lots of water and a large enough pan. 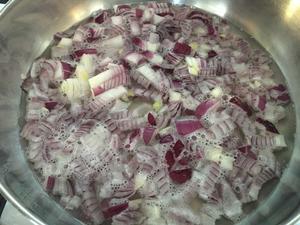 Once the water starts to boil—let it simmer until the potatoes are almost cooked. Use a fork to test. For me it takes between five to ten minutes maximum—so don’t go off somewhere! 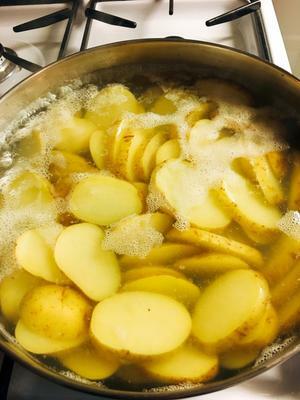 Once nearly cooked transfer the potatoes into a large bowl with cold water. Keep adding cold water until the potatoes are cold. 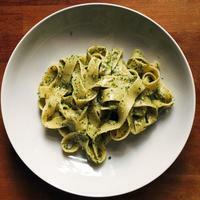 You don’t want them to cook anymore—important! In a large pan add the chopped onions and a little water. 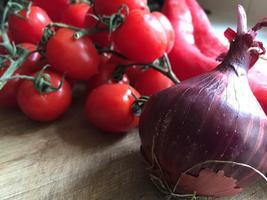 Sweat the onions on a medium heat for a few minutes until tender. Turn the heat down. Add salt and pepper and cayenne pepper if you want it a little spicy. 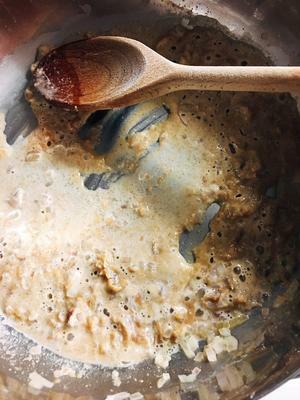 Then add a couple of table spoons of tahini and mix well. You may need to add a little more water to create a sauce but not too much. Depending on whether you’re going with spinach or broccoli/red peppers. Follow point six or seven and then continue with eight. Add the baby spinach and cook on a low heat until the spinach has wilted. 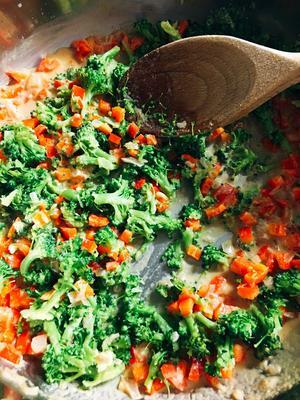 Add the red peppers first and cook for a couple of minutes and then add the crushed broccoli. Drain the water from the potatoes and add them to the pan. 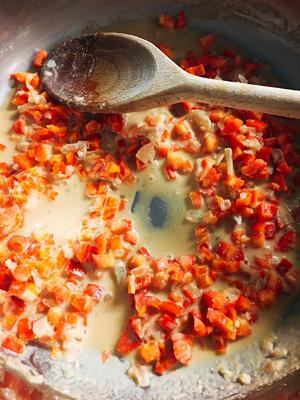 Gently start to fold the mixture and mix well—still using a low heat. 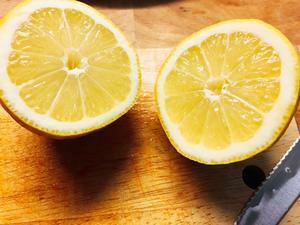 Add the juice of a lemon and check the seasoning—adjust this to your taste—important! 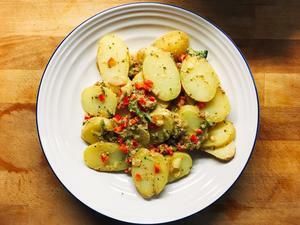 Once you’re happy with everything and the potatoes have warmed through, add some olive oil and mix gently for one final time—careful not to to break up the potatoes. Serve on their own or with a salad. I think this is dish is great as a meal, part of a salad or as a party food. The overall cooking time (including preparation) when I make is dish is about 25 to 30 minutes. 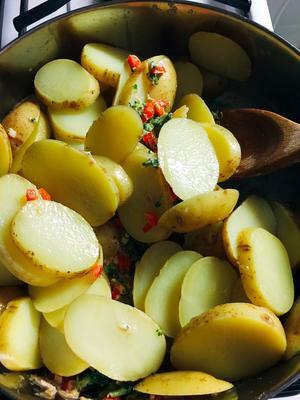 This will vary for everyone as different varieties of potatoes will cook slower or faster, but I think it should not take you more than 40 minutes to make this dish. The most important thing is to keep an eye on the potatoes and not took cook them too much in the water. Test with a fork and you just want the fork to pierce the potato slice but not the break it apart. And once done to put straightaway into cold water.